Last Sunday, the girls and I had a fun day shopping and lunching in Waikiki. In between looking through the racks of clothes at Forever 21 and indulging in bread and pasta at Cheesecake Factory, my mom and I squeezed in a little time for a short photo shoot. 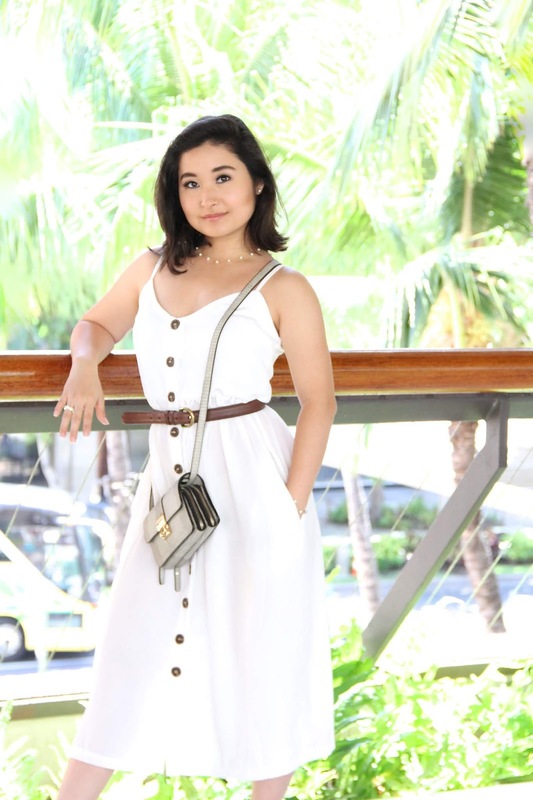 Shein was so kind to send me this white summer dress, and I wanted to share it with you all here on Elizabeth, Marie, and Me. 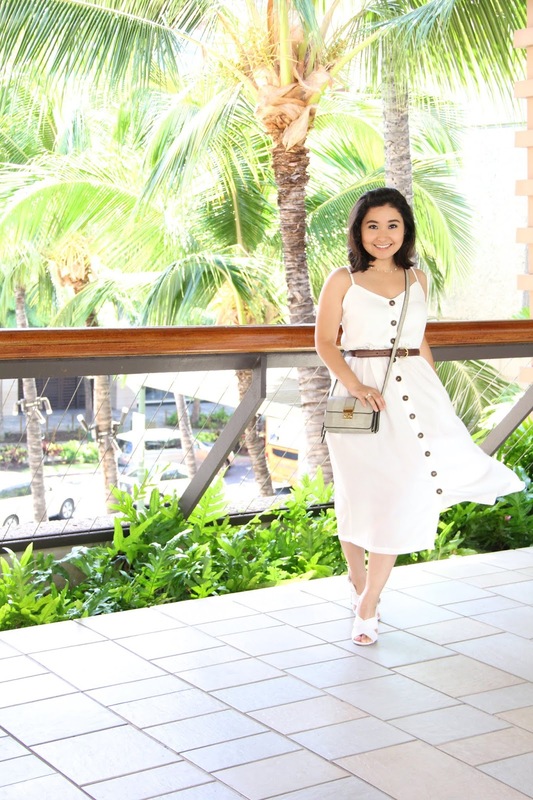 It was a scorching hot day here in Hawai'i, so it was the perfect opportunity to wear a casual button-down cami dress. The billowy silhouette of the dress made it very comfortable to wear all day. And did I mention it has pockets? Yes, this dress has pockets, the added bonus to any dress or skirt! 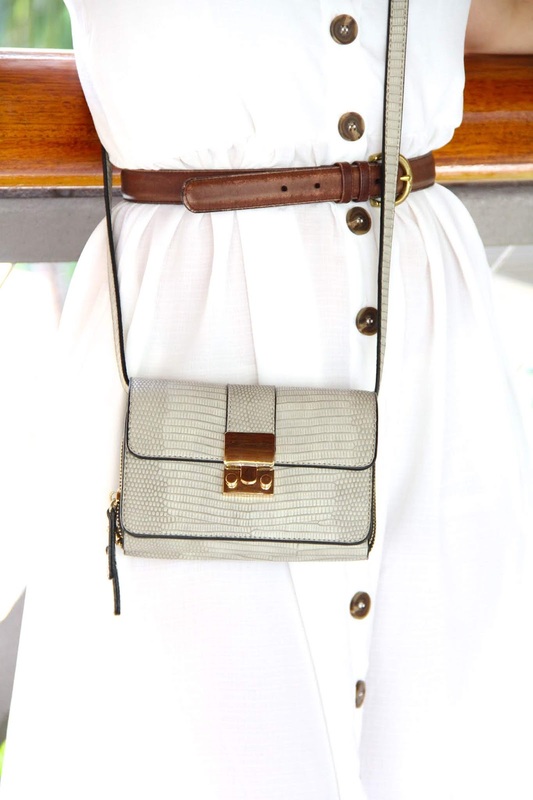 That day I chose to style it with a vintage brown leather belt and my favorite Sondra Robert crossbody purse. 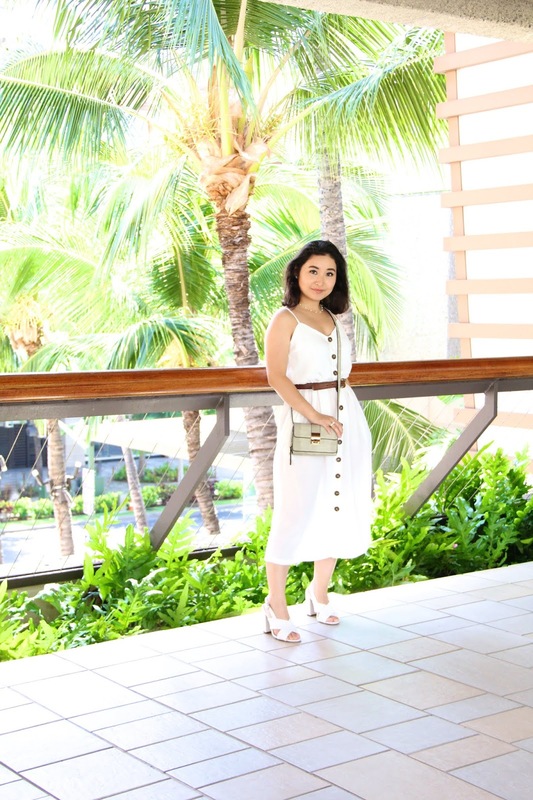 With the intention of venturing into Waikiki that day, I opted for a resort-inspired outfit. Maybe it's the Hawaiian music playing at the Royal Hawaiian Shopping Center or the tropical feels, but there is something about the ambiance of Waikiki that always makes me want to play tourist when I'm there. For this photo shoot, I opted for these heeled canvas sandals to complete this look. I've never owned espadrilles, but the fabric reminds me of them, so I guess you could say that these sandals are my version of them. Lastly, I wore a few simple jewelry pieces to add a little pinch of fabulousness. 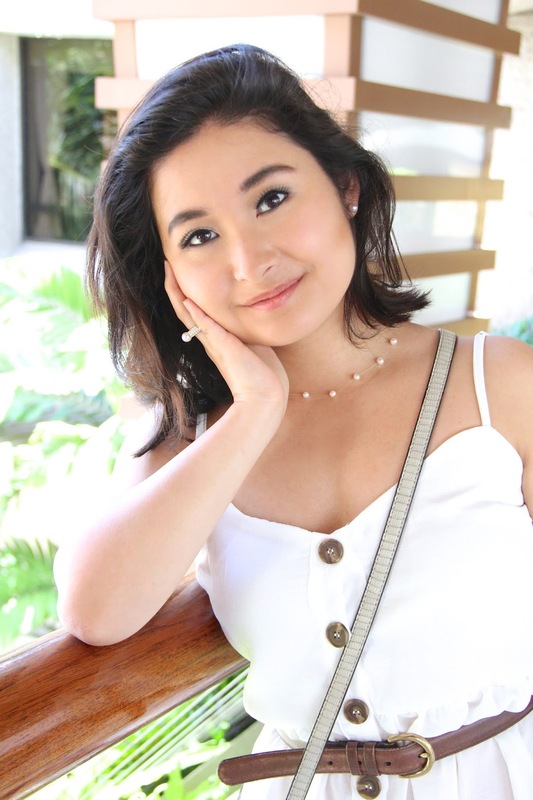 Studded pearl earrings, a faux pearl ring, and a pearl necklace did the trick. I know the 70s are serving as inspiration for a lot of fall pieces this year, but does anyone remember wearing this floating pearl necklace in the 90s? I do, and I am single-handedly trying to bring them back. I found mine at the bottom of my jewelry box and decided to wear it for nostalgia sake and because it went perfectly with the pearl theme. That officially completes this resort look! I hope you got a bit of style inspiration for an upcoming summer trip. Let me know in the comments below where your summer travel destination of choice is. I would love to know! Mine would be Italy or Greece! 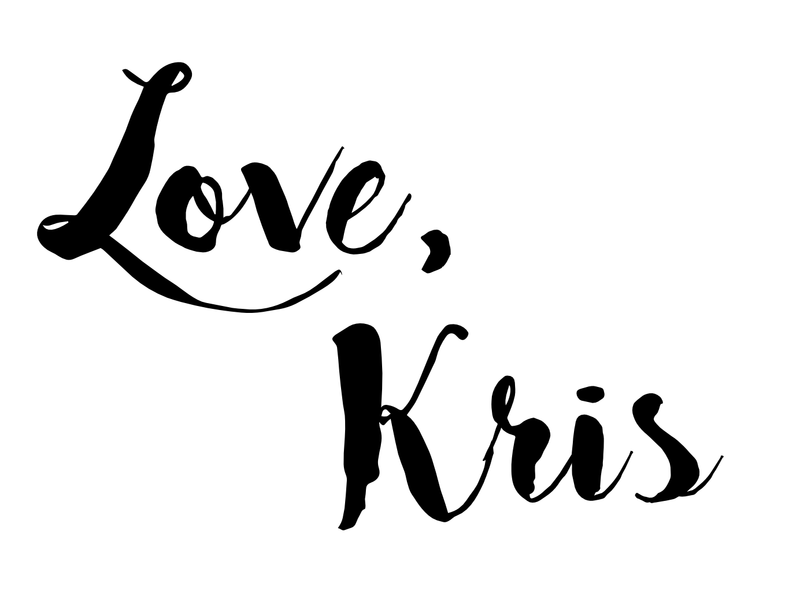 Anyway, I am sending each and every single one of you lots of love from my heart to yours!